Looking back, lots of people build a business, but few are able to build a business that will not only last a lifetime, but become stronger and stronger, generation after generation, but RM Parks has done just that! Now at the age of 94, RM’s Petroleum Products business is a thing of beauty and it runs like a well oiled machine. 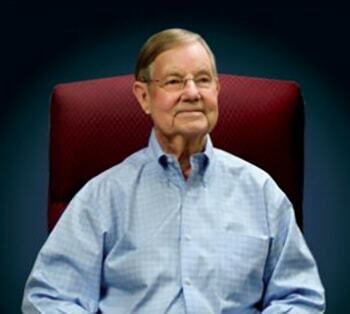 Through the years, RM surrounded himself with talent and reinvested heavily in his business. Knowing that the key to building a lasting business was forming enduring relationships, he set out to create a family atmosphere not only within his company but with his customers as well. Always thinking of his employees and customers as family has built a bond that holds true to this very day. 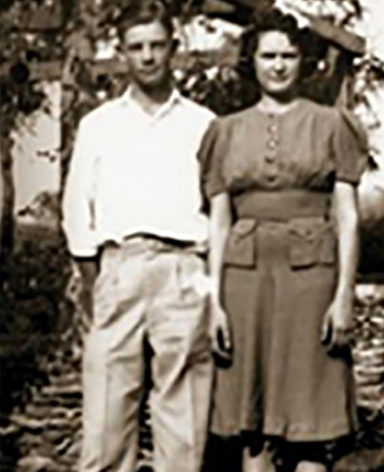 RM and Clarice Parks both grew up in the foothills of Porterville, California. They first met when RM was driving a school bus. Clarice was one of the students he picked up on his route. After RM finished high school, he attended Porterville Junior College and it was during this time that WWII broke out. After enlisting in the Navy, he was sent to the University of Texas in Austin, where he attained a degree in Civil Engineering. Once college was completed he was sent to Rhode Island to complete Officers Training and the RM was given his first assignment in the Philippines building airstrips. RM’s last assignment was in China. During this period of time Clarice had married and had a daughter. But her husband was killed in the war. Once the war was over and RM had finished his tour of duty, he retired as a 1st Lieutenant and came home to his roots in Porterville. Not long after that, RM and Clarice would meet again, marry and form a lifelong partnership. And the next generation of Parks family began. RM adopted Clarice’s daughter and soon had two daughters of his own. RM and Clarice’s first challenge was to build a secure and loving home for their family. They did this by building a ranch where they grew cotton, alfalfa and row crops. Later they added fruit trees to their growing operation. And in 1968 RM and Clarice sold the ranch. RM and Clarice used that very formula! After selling the ranch, as luck would have it, the man they purchased fuel from to run the ranch talked to RM about wanting to sell his fuel business. RM and Clarice saw this as a perfect opportunity to reinvest in a new dream. 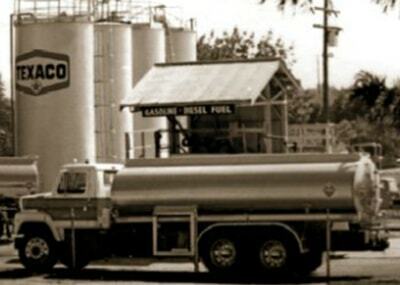 In 1969, RM and Clarice purchased the fuel business and became a Texaco Consignee. 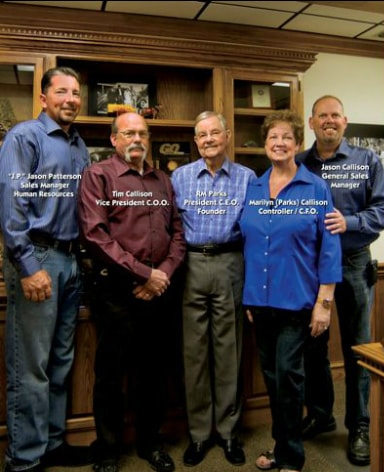 When RM purchased the Texaco plant in December 1969, he started out with his son-in-law, Tim Callison, one truck driver, and an office secretary. Their customer base consisted of 12 Texaco stations and approximately 35 to 40 farm accounts. The bulk plant sold gasoline, diesel fuel, motor oil, weed oil, lubes and a line of products known as TBA (tires, batteries, and accessories). In the beginning, the plant’s monthly sales volume in gallons was approximately 130,000 gallons of all products combined. To help grow the business, Tim delivered fuel, filled wind machines at all hours of the night during the cold winters, performed cleaning and maintenance tasks. Tim began calling on new customers to expand the number of retail outlets serviced. In 1974 RM’s daughter, Marilyn Callison, the 2nd generation, came to work for the company. Marilyn had previously worked for a local accountant, her experience in accounting and finance would assist in the company’s future growth. RM’s oldest daughter, Gail Enterline, also 2nd generation, joined the company in 1977 and worked as the office manager until her retirement in 2004. Through the years, as the company grew and developed, the family always pulled together. Jason, Tim and Marilyn’s son, as a young child would ride in the truck with his dad helping with the farm deliveries. He continued working during his summer vacations throughout his school years. In 1984 Jason, the 3rd generation, came to work for the company doing cleaning and maintenance tasks, all the while working his way up through the many different job duties to gain the experience thats was needed for customer sales. Jason Patterson(“J.P.”), Tim and Marilyn’s son-in-law, came to work for the company in 1994 as a truck driver and began learning the business, visiting and assisting the customers on a daily basis. The experiences gained by each one working their way from the bottom up, has helped each of them to learn and understand the business which has enabled them to make contributions to the company’s success. In 1996, RM and Tim added the Shell brand to the company becoming one of the largest Shell wholesalers in California. In 1998, RM and Tim decided to branch out and RM began designing and constructing convenience stores, which were called “Parks Place”. The company developed 5 locations which it owned and operated until 2005. With RM’s valuable experience and knowledge, RM Parks Inc. now services over 240 branded and unbranded locations. Today, three generations of Parks are carrying on the family tradition of transporting gasoline and diesel fuel products throughout the State of California from Sacramento to Los Angeles. And they have only just begun.